When I first moved into the Uotila system to exercise my rights as Supreme Protector of the system, one ice miner in particular attempted to set himself up as the resident "wiseguy" who would oppose me. But M 13's bravado quickly diminished as Agents of the New Order swarmed the system over the next few days. M 13 found himself circling the downward spiral from "tough guy" to "whiner" to "petitioner". Many others have taken that same path. It's a tragedy each time. To help CCP act on his many petitions against the New Order, M 13 began logging his encounters with Agents in local. 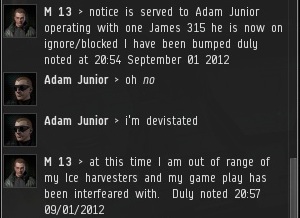 M 13 is far from the only player to have disgraced himself by petitioning us, but I believe he's the first to keep a public log of it. It's possible to at least attempt to reason with miners who petition, but what about people who petition in such a robotic fashion? It seems to me that this is a natural outgrowth of the miners' steady march toward automation and robotic behavior. I wonder, will future versions of ice mining bots have macros that produce tears while the miner is AFK? To receive such recognition is truly an honour. 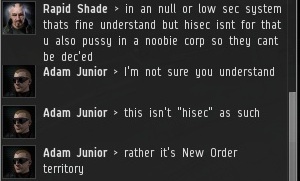 May all of hisec one day become the dominion of rightfully self-elected leader, James 315. Well spoken. And your contribution to the New Order is "duly noted"! Fileation? Really? That is one of the sorriest misspellings I've ever seen.